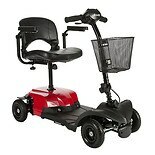 If you'd like more freedom of mobility, browse our selection of 4 wheel scooters. You can get around more easily with fun-to-drive medical scooters. The placement of two wheels in front and back offer stability for outdoor surfaces. 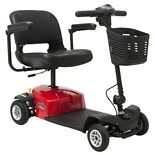 You'll find four wheel scooters in various colors from brands such as Shoprider and Pride here at Walgreens.com. In the past, 3 wheel scooters were best for maneuverability and 4 wheel scooters offered a stable option. Today, four wheel scooters can fit and turn in tight spaces similar to scooters with 3 wheels. 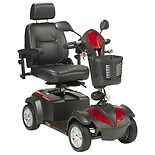 There are models of each kind that accommodate taller users with added legroom, and swivel seats can make it easier to get on and off. 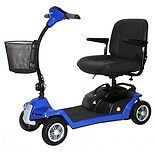 Some medical motor scooters also fold for simple storage and convenient transport. 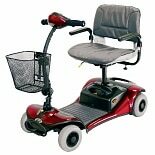 With the range of mobility equipment available, you can get around more comfortably and safely. You can even choose between different types of crutches, from forearm crutches and tall crutches to bariatric crutches and heavy duty crutches. 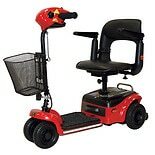 You'll find an assortment of walkers and rollators, which are similar to walkers but can have large wheels and safety hand brakes. For help using your mobility aids, there are also crutch accessories, walker accessories and scooter accessories.